Alright, so this isn't really a toy review. but I figured that good ol' Mikey does bust reviews upon occasion, I'd throw this at him. It's not much different aside from the lower torso. And if you're reading this then I used good judgment and didn't waste any time. On to the review. 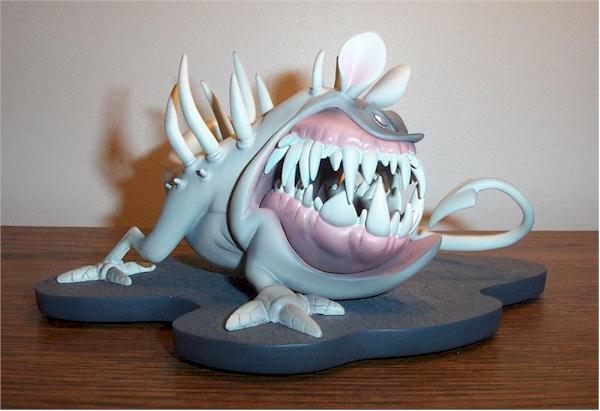 This is the 'Demon Dog Rabbit' Insanely Twisted Rabbits Polystone collectible based on the illustration by Michel Gagne. It's produced by the wonderful, talented folks at Sideshow Collectibles. It's a limited run of 1000, and I like it. Oh, and Sideshow says it's sold out. Why does everyone seem to start the review off with packaging you ask?? Well, because you must first get past the chest to get to your treasure. On the way you may as well take a second to look at it. Why I gave this packaging 4 stars you ask? Have you seen the pictures I so graciously took for you? This box is work of art. In all honesty, it was the box that won me over in the first place. Sure the statue was neat and cool. But look at the box!!! 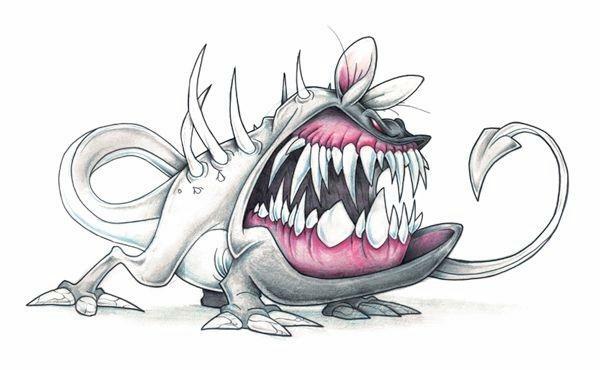 It's got a great image of the Demon Dog Rabbit drawing. It's like he's eating himself!! How cool is that?!! It also has everything you'd want to know including the sculptors name. 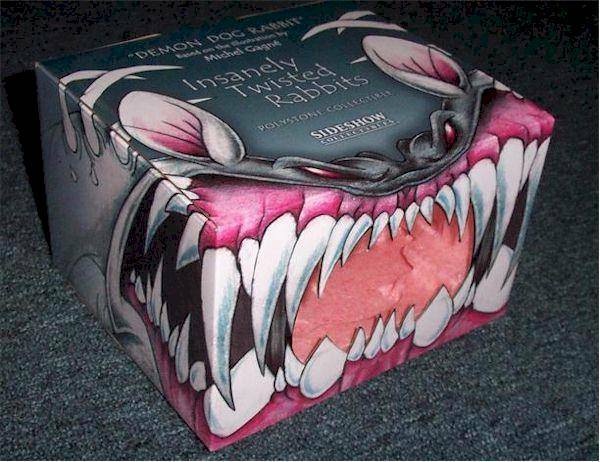 There's even a little blurb on the back that tells the heartwarming story of how the 'Insanely Twisted Rabbits' concept was born. Short story even shorter, the guys creative and he worked in animation. Oh, and he's a good drawer. The edition number is on the bottom in the form of a sticker. (incase you're wondering, I own 0193/1000. Spiffy eh? ) It kept good ol' Demon Dog Rabbit nice and safe on his travels to me. The foam is even tinted pink to assist in the inner mouth motif they seem on going for. So you finally got me off the topic of the box eh? Lucky you. 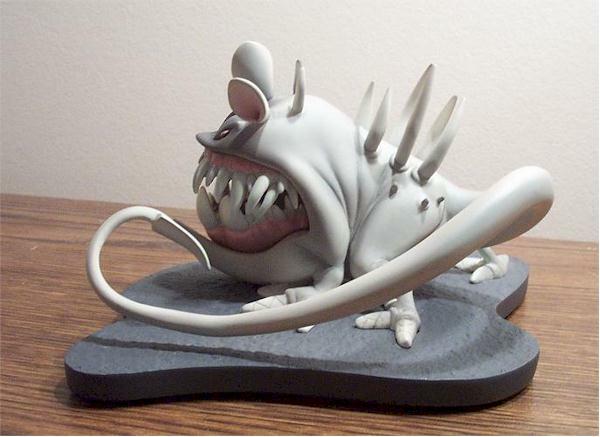 Now I ramble about the sculpt. Overall it's pretty good. No complaints. It's a difficult task to take a drawing, or sketch and make it into a three-dimensional object. Props to Mat Falls. I'm not sure what else he's done so this would be a good time for an editors note if you know anything. I took half a star off because there's an opportunity for some detail. but it wasn't taken. Sure this is a representation of a previous form of art, but there could have been a little texture worked into it. There's really only some sort of deviation of smooth on the base (kind of a stony texture) and on the claws (in the form of cracking lines). But purely basing this sculpture on capturing the essence of the drawing, I've got to give the sculptor credit. Granted it's not perfect, but definitely worthy of ***1/2 stars. There's not a lot of it, but where it is used, it works. Especially considering the coloring technique of the artist. There's sufficient shading where it's needed. It breaks up the monotony of all the light grays nicely There's no slop on the gum line or the eyes. While I'm on the topic of the eyes, they are nicely done. There are three colors. Very dark brown, not so dark brown and then the glimmer of white. They add a nice dimension to it. A creepy dimension. Demon Dog seems sturdy. He's just heavy enough to feel expensive, which is a nice thing. 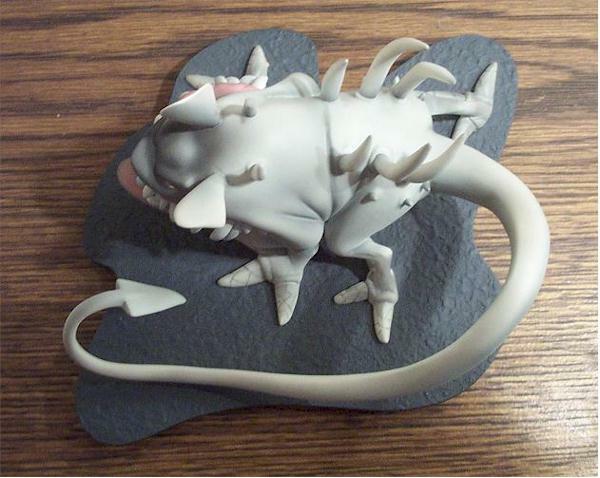 I'd be cautious with the tail, back spikeys and ears. Just because they protrude and are fairly thin, and I'm paranoid. Let's just say he won't be displayed where anyone's gonna be taking a dive on him. At first I was put off by how tiny he is. But the more I look at him, the more I like him. 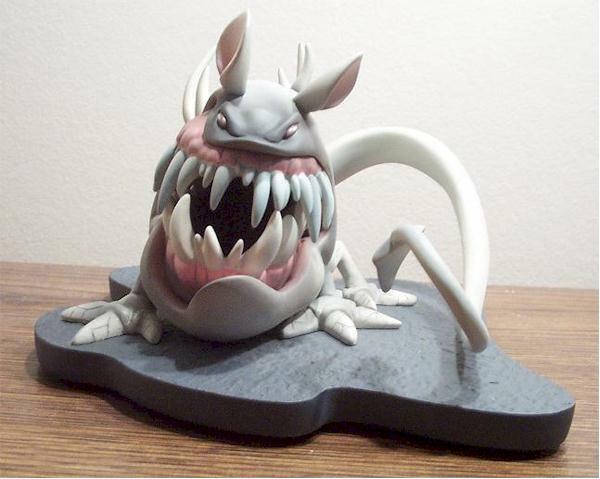 The sculpt is quite good, and the paint ops are as good as they could have been. He seems sturdy enough, and the run is fairly low. Even the price point isn't that bad. I'd buy him if I were you, even just for the box. But get him fast, he is a rabbit after all. - Entertainment Earth has him for $38.99 plus shipping. 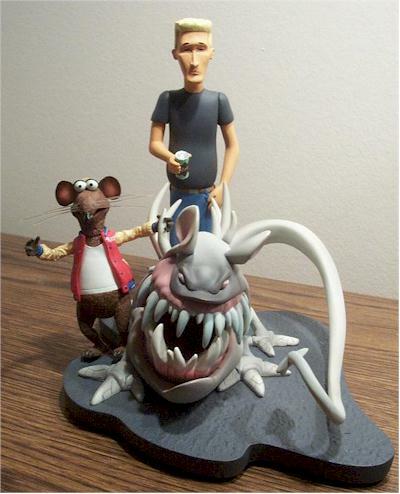 Figures from the collection of Ryan Bradshaw.